I love this product! Chocolate peanut butter is by far my favorite flavor with chocolate as a close second. I've been using Idealraw for over a year now and love it. I've tried other plant based proteins and this one is by far my favorite. As with any plant based protein, it can be gritty. But, you just have to blend well. I brought this pack and received well packaged and within one week. Love the flavors and love the cup. 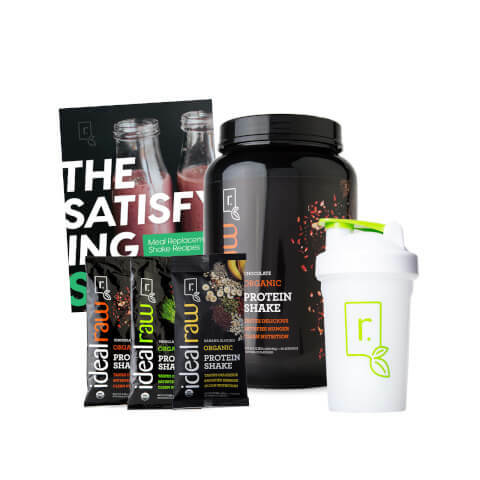 IdealRaw is great for me as my tummy could not handle the whey protein. I have no problems with Raw. I ordered the vanilla protien. It has a nice flavor but even when mixing with almond milk it's still chalky. I'm not sure which protien I like more but they both are decent. I think IDEALRAW ORGANIC PROTEIN is Great This is the Best ProteinTo Make A shake With, I Put Kale & Spinach in the bottom of my bullet then Blueberry's blackberries, Raspberries,Strawberries Just a Few 1/4 of avocado 3 Sliced Carrots little Round ones, 2TBS. Raw Old Fashion Oatmeal, 1TBS of Organic Toasted Coconut , IdealRaw Organic Protein, 1/2 Cup of Kiefer everything is Organic. Then Turn It On It is a great Shake and it does keep you FULL. I love this protein! I searched for days and hours looking for the best plant based protein i could find for the best price and always came back to this one. I ended up ordering it and I am so glad i did! First off, I love the taste! It tastes like chocolate Almased, if any of you have ever tried that stuff! Definitely a different taste from whey protein. It mixes really well, and i am so happy to say it doesn't mess with my stomach or make me feel bloated. If you haven't already gotten on the ideal raw bandwagon, go do it now! You won't regret it! Obsessed with ideal raw, and ideal lean products! Oh, and its awesome that you get a shaker bottle, which is smaller than i expected and doesn't feel as high of quality as my others, but i really like it and seem to grab for it more. Its also awesome that you get two free samples so you can try both flavors!